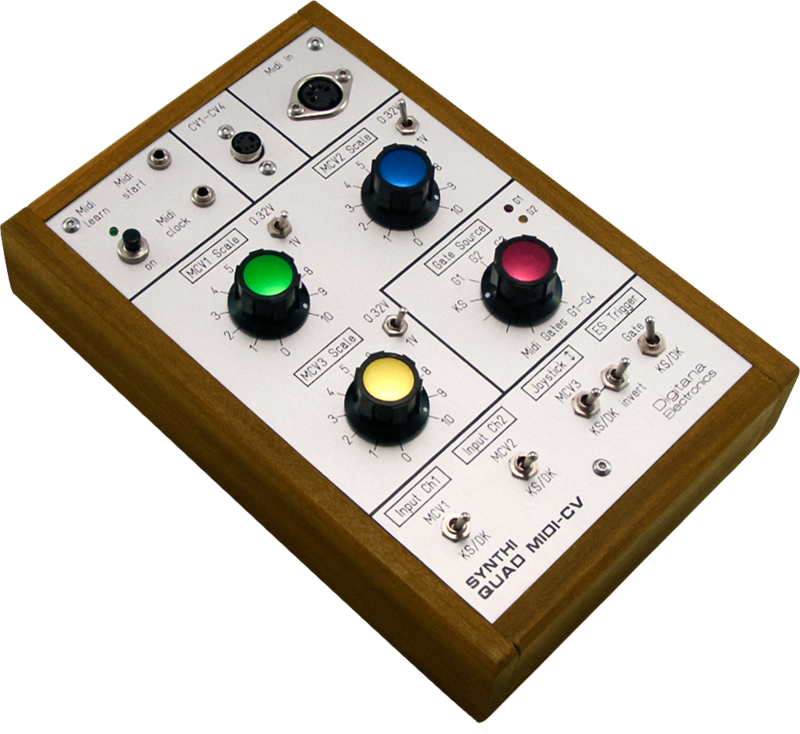 This is a Quad MIDI-CV unit designed to be used with a Synthi VCS3 Mk2. It's basically the same spec as the Synthi AKS Quad MIDI-CV. It is based around Marc Bareille’s fantastic four-channel microcontroller based MIDI-CV converter called the ‘MCV876’ (which Marc has kindly allowed me to incorporate in the modules). The unit has Envelope Shaper (ES) trigger assignable to either DK trigger or any of the four gates (Gate1 to Gate4) via a front panel rotary switch. How many of the four gates are available depends on the mode used. For example, in Poly2 mode, only two gates are available (Gate1 and Gate2). In Poly4 mode or Controller mode all four gates are available to trigger the ES. Red and green panel LEDs light when MIDI Gate1 and/or Gate2 are triggered. Gates5 and Gate6 outputs are via 3.5mm jack sockets and offer MIDI start/stop and MIDI clock signals for interfacing/synchronizing with other external MIDI devices. There are three front panel level pots for CV1 to CV3. Also there are three toggle switches that can flip the scaling between 0.32V/octave (standard Synthi oscillator scaling) or 1V/octave when pots are set to max level (10). The 1V/octave option is useful if a CV channel is being used as a modulation source rather than give pitch control of a Synthi oscillator. Toggle switches allow independent switching of DK control or MIDI-CV control of each of the three independent CV input channels of the AKS matrix (Input Ch 1, Input Ch 2, and row 16 of the matrix). There is also the option to invert CV3 source into row 16 of the matrix via another toggle switch... again adding to the creative possibilities. Finally CV1 to CV4 are also available via a special cable that connects to the unit with four EMS patch pins on one end and a mini-DIN plug on the other. The CV is connected to the tip of the pins only and is designed to be able to inject CV1 to CV4 into any of the Synthi control inputs (i.e. matrix columns). The pins are colour coded with green, blue and yellow corresponding to CV1 to CV3 and black for CV4. The point of this cable is that CV1 to CV4 can be used even when control of the Synthi input channels is via the DK (via the toggle switches). So its possible to use the DK keyboard and still have CV1–CV4 available via the matrix pin cable to add dynamic envelopes created via MIDI for filter control, reverb mix and output channel level envelopes etc. It can be used, for example, with three of the four channels being used to inject CV1 to CV3 into the matrix (Input Ch 1, Input Ch 2 and row 16) and the forth channel used to offer novel triggering modes of the ES. The unit derives its power from VCS3 and is about 100mA mainly from the +12V side of the power rail. Tests on my VCS3 (Mk2) and DK2 power rails show there is more than enough power in the main PSU (which is same as the Synthi AKS main PSU) to cover this additional drain even with the DK2 powered up.